With the rapid change in technology in the digital world, online security has become a major concern. To ensure the online security you have to work hard. Almost every day we receive news where some big company has been hacked or some top security data has been leaked by hackers and so on. The worst thing is we can't prevent this hacking to 100% but we can take some precautions using which the risk can be lowered down and you can protect yourself from such activities. 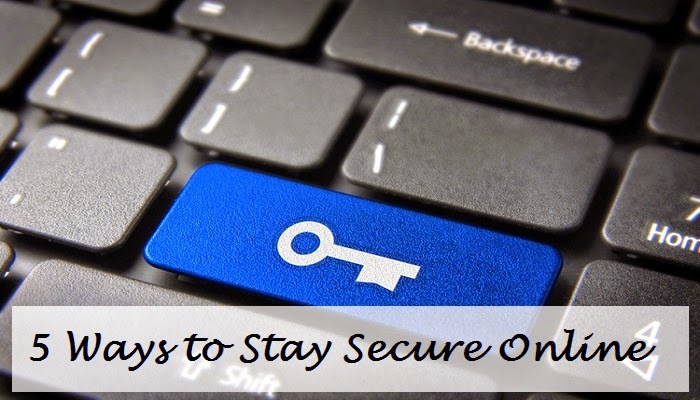 Today I am going to share 5 ways to stay secure online free. These methods are completely free and you will not have to spend a single penny. In return you will get a great security. So here is the complete guide on how to stay secure online free. Many of us have a habit of using the same password everywhere like emails, social media, bank accounts etc. The main reason behind choosing the same password is, it becomes easy to remember. But this habit can create some serious problem for you. If any one of your account/sites is hacked then automatically all other accounts will also be at high risk and anytime it can be damaged. Hackers usually try checking different accounts once they hacked anyone and if they succeed you will be in serious trouble. So the ultimate solution of this issue is to use different password for your accounts. Also while creating passwords, use strong password. Here strong password means, use the combinations of lower case, upper case, numbers and special characters. These passwords are very hard to hack. Many of us have a habit of downloading the software or any other files from any site whichever comes first the in search engine. But you should avoid this practice to stay secure online. Many of these sites either asks you to complete a survey to download the software and by doing so they collect your personal data. Even if they don’t use the survey to collect your personal information many of the sites uses Spyware which vanishes the security and accesses your information. So be cautious while downloading the software from any sites for free. Ensure the site is genuine and have good feedback. This includes antivirus as well. I always suggest buying the genuine antivirus as the free version of it doesn’t provide much security and it would be hard to stay secure online. Instead, you can search for some offers and get a premium antivirus at less cost. This is one of the best methods to stay secure online. Between all your social profile and other online accounts, just check how much information about you has been shared online. You'll be surprised to see the amount of data found online. There are multiple online stories where someone has had hacked and identity was stolen. So it is a best practice is to audit your available information online and remove whichever not required or set a protection as who can see that information and who not. By this way, you can be safe with the unethical online activities. On the internet, you will find many offers which will attract you and automatically you will download or subscribe those. But these may contain some type of online promotions also and you should be very mindful while doing so. If you do not want to receive junk emails or get on the telemarketer list then just check the small checkbox at the bottom of the page while signing up else very next day your mailbox will be full of promotional/lottery emails and accessing that info may harm your accounts. Many of these websites put adware on your computer with the downloaded product which tracks your activity. Use caution whenever you are come up with these kinds of websites and be secure in the online world. This is the best idea to keep your online accounts secure. The accounts which are enabled with two-step authentication are less likely to get hacked. Here usually one is your personal password and another password is getting sent to your registered mobile number at the time of login and so only you can access the account. Google provides this kind of security along with many other websites. Here if you are logging to a new system, a code will be sent to your mobile and only after entering the code you will be able to access the account. If that is your personal system you can use the “don't ask code” on this system again option. Some sites don't use the code, instead, they ask security question which you have set at the time of registration. So make the question bit difficult and tricky so that hackers can't guess. These were the top 5 ideas using which you can be secure online. I hope if you will follow these methods you will be protected from any unusual activities. Are you following these tips for being secure online? Or using some other methods as well? Do share your experience with us.